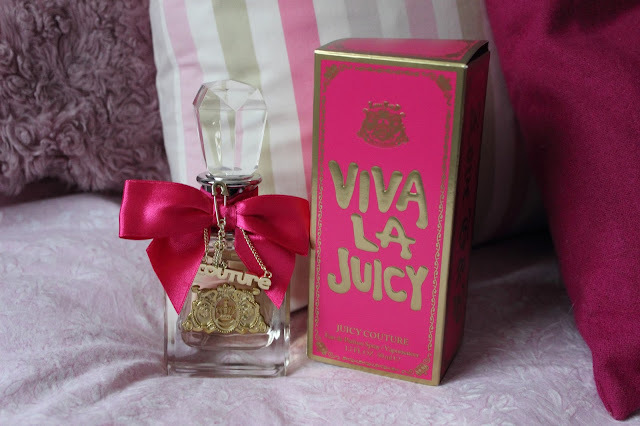 As you would have seen from my Christmas post, Juicy Couture Viva La Juicy is my favourite perfume and has been for the last few years. I have always preferred the fruity scent over the floral one but this is the perfect mixture. With the sweet notes of Honeysuckle, Wild Berries and Amber, this perfume is a lovely choice for ladies like me, who choose the sweeter and fresher scents. I love the packaging; some might find it tacky or too much but I think it's different and it feels like a lot of love has been put into the design with the pink satin bow finishing it off. The only flaw has to be the lasting power as it's only prominant for a good few hours before you feel like you have to re-spritz! Overall I think this is a lovely, fresh and fun perfume and I would really recommend it if you were looking for a new scent.